I wasn't the least surprised by Tengku Adnan Mansor's stupid remarks; this is the sort of rubbish one spews when one is brain dead and long past his expiry date. Read my older posting Tengku Nan's dead to understand where I'm coming from. That was a decade ago and he has not learned anything! People are not angry with Umno; they have been angry with some politicians in Umno. Some of the politicians they were angry with have been sacked and some recently left the party to form other parties in the hope of regaining power. But there are the likes of Ku Nan still around and still holding significant positions in government since then (when Dr Mahathir Mohamad took them, including Ku Nan, in) till Pak Lah's time and now with Najib Razak as PM. 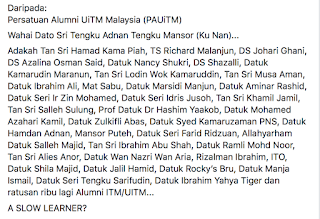 Even if he hadn't run down the 720,000 graduates that ITM/UiTM has churned out (and the 165,000 students currently chasing their papers in over 30 campuses throughout the country), Ku Nan was already that rotten apple in Umno. Residents from Datuk Keramat to Taman Tun Dr Ismail have been up in arms against his "projects" over the last couple of years. A week or so ago he finally felt he'd better meet the residents of TTDI who are fighting to save their Rimba Kiara but his address, to no one's surprise, did not go down so well (The day Ku Nan allegedly Lied to TTDI residents - The Mole, Nov 26). Agree with you. He is past his date and DSN should take note that people in Putrajaya cannot tolerate this man anymore. Please la DSN get him out of his suffering. Maybe he could be assigned to concentrate his duty as UMNO SG? Please get us a better and intelligent MP. Please get AWO for us Putrajayans. Saya graduan itm. saya bukan slow learner. pernah kerja nak bantu Ku Nan tu berniaga, yang pasti biz dia gagal sebab dia yang slow learner. Pengalaman saya dr multinational itu saya curahkan nak bantu dia berniaga sebelum dia jadi menteri. Biz restoran dia lingkup. Yg lingkupkan adalah kaum kerabat dia juga. Yang pasti saya tidak marah UMNO. Saya setuju dengan ROCKY. Saya tahu pengorbanan UMNO dan UMNO tidak perlu melayu slow learner mcm beliau dalam umno utk GE14. 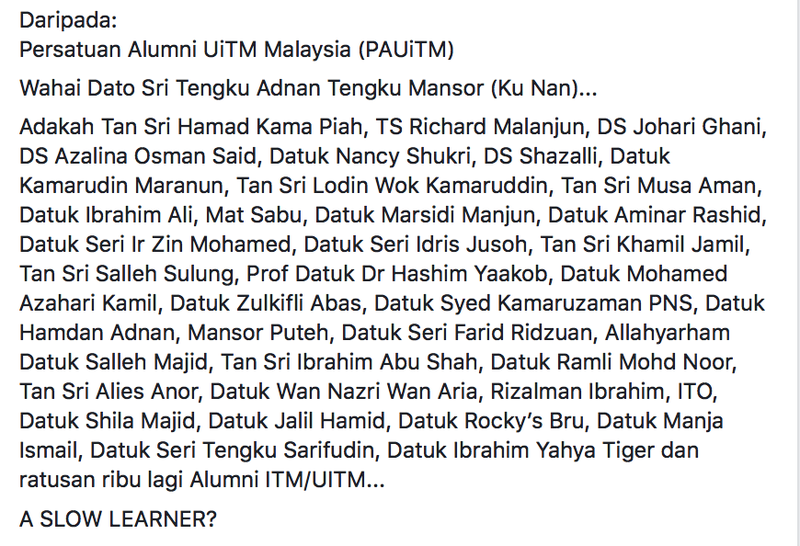 Teruskan menegur pemimpin yang tak relevan dalam UMNO ni wahai Alumni uitm. Syabas! The kemarahan of Malaysians is actually directed at the world's biggest klepocrat. Compared to that, KuNan is a kuman. There is some truth to what ku nan said. In the 80s, 90s, 20s, many students who failed in their SPM entered schools,collages and Universities through recommendations by politicians. Priorities were given to UMNOs children and Malay. These students were not fit to enter U. Many of them failed their examination papers with only one or two passes but politicians can do wonders. The university deans were obliging too. If students cant perform, how did they graduate? They copy, plagiarise and some even pleaded with the politician to pursuade the deans to get them through. These applies to many faculties and many Universities. Even lawyers seeked help from politicians to pass their failed papers. The practice is still alive. Don't just blame one person idiot though he is. Our public universities have failed in every way. It was UMNO who promoted the idea race was more important than ability and even then only if your parents were with UMNO. Even Mahathir will not able to fix this what with the little UMNO Napoleans embedded so deeply in our public life.